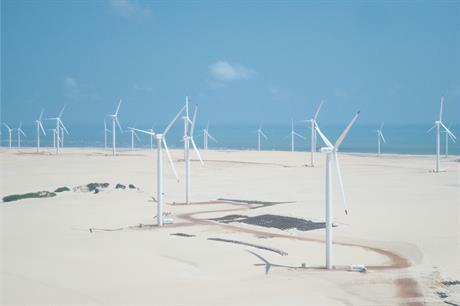 BRAZIL: Wind projects took a third of the capacity awarded and prices increased in the country's latest auction, the energy regulator has announced. The 48 successful wind farms have a combined capacity of 1,251MW and will receive an average price of BRL 90.45/MWh ($22.29/MWh) under 20-year power purchase agreements (PPAs). In Brazilian Real terms, this marks a 33.8% increase on the BRL 67.60/MWh (US$19.95/MWh at the time) achieved in April. However, due to currency effects, in US dollars this is only an 11.7% rise. The projects must be commissioned by 1 January, 2024, under the rules of the tender. Successful bidders included EDP Renováveis’ (EDPR’s) Brazilian arm, which won capacity for its 176MW Jerusalem and 253MW Monte Verde projects, which will both be located in the north-eastern state of Rio Grande do Norte. EDPR’s CEO João Manso Neto described Brazil as a "strategic market" for the company and said: "The abundance of the wind resource, stable regulation and our experience in the market are factors that leave us optimistic about the future in this region." EDF Energies Nouvelle’s local subsidiary, EDF Renewables, was also successful, being awarded two wind projects in north-eastern Bahia state with a combined capacity of 276MW. It will build a 147MW extension to its 114MW Folha Larga site, and a 129MW addition to its 183MW Ventos da Bahia project, both of which it secured capacity for in the tender in April. EDF Renewables added that the Ventos da Bahia wind farm would be commissioned "within the following weeks". Energy regulator Aneel added that the total investment in the wind projects would amount to just over BRL 5.8 billion ($1.4 billion). It had awarded contracts for capacity across wind, hydroelectric, thermal biomass and thermal-to-natural gas projects in the latest auction, which was concluded at the end of August. The latest tender had been temporarily suspended on 31 August due to a judicial injunction, Aneel stated. However, later that day the energy regulator announced that the attorney general of the union had overturned the injunction in Brazil’s superior court of justice, enabling the auction to take place.